In February 2018, I visited the German city of Berlin to play escape rooms (and do a little tourism!) as part of a group of ten enthusiasts. 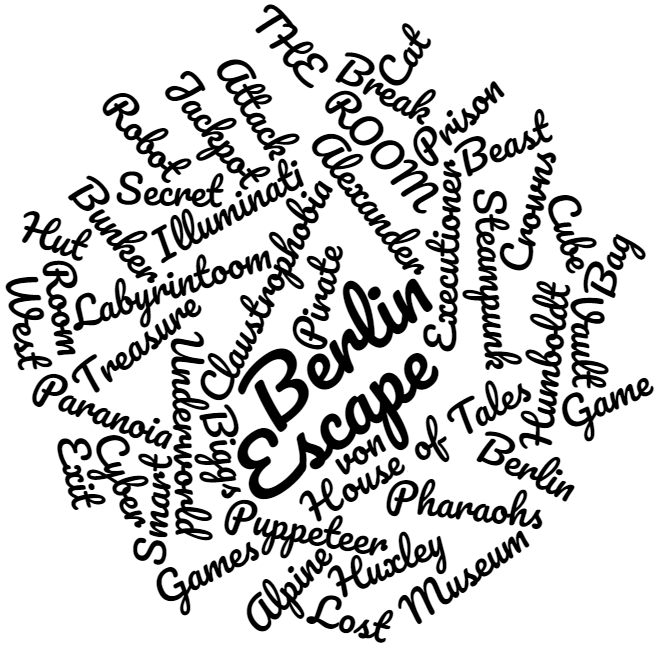 While there, we played around 20 games in eight venues across the city, so I’ve hopefully got a pretty good view of the escape room scene in Berlin. I built up the list of games via recommendations from other visitors and bloggers, including Sera from S², Stefan and Alex from Two Bears’ Life and Sebastian from Escape Maniac. If you’re heading to Berlin and looking to play a few games, then hopefully this series of posts will give you a leg up on the research! Most of the venues were pretty walkable from the centre (for a map to help you plan, click here), but there are a few that you’ll probably want to use public transport or Ubers for. Similarly, the train ride in from the airport was reasonably cheap and easy – right into the heart of town – so, from a transport point of view, it’s an easy city to play in. Overall quality was high, with some truly outstanding games. Certainly better quality than the London scene but not up there with Hamburg, in my opinion. The standard of English was pretty much perfect throughout, and the GM-ing was good. If I had to pick out one strand that ran through the games, it was that a lot of them felt quite “Claustrophobia-style”: beautiful sets, entirely automated games, puzzles that seem logical once you know the answer but feel a little like you have to guess what the designer was thinking. The most impressive game of the weekend was undoubtedly The Lost Treasure of Alexander von Humboldt. In fact, all three of the games at THE ROOM were incredibly high quality, and I’d have no hesitation in recommending any or all of those games. If you’ve got four people, I’d definitely recommend a trip to Andere Welt at Smart Room, especially if you are particularly interested in games with plenty of communication. I also really enjoyed Illuminati Escape‘s Jackpot, with its fun puzzles and cool theming, the Executioner at House of Tales and the dystopian cyberpunk theming of Robot Paranoia at Final Escape. Huxley at Exit VR, while not a style I’d want to play regularly, is definitely worth adding to your itinerary. Finally, Vault 13 at Claustrophobia is a pretty game with good puzzles and one particular element that really surprised me. Really interesting to read these reviews- only just found your site via Twitter but like how you can give a good flavour of what to expect while avoiding spoilers! We’re hoping to go to Berlin later this year as a couple – do you know any of these that would be especially suitable for just 2 people? The Room’s Go West would be my #1 choice. Any of Claustrophobia’s or Cat in the Bag’s. If you can book Huxley as a two, that would certainly work – my recollection is that you have to book as a 2v2 game but there’s no interaction between each of the sides so I don’t know why that would be the case. If it is the case, it’s worth looking for a last minute spare slot and asking them if you can book for just 2. If you tell me some UK games that you liked then I might be able to direct you to specific ones that you’ll enjoy. Thanks for the quick response – we’ll check them out! We’ve only done 7 escape rooms in various combinations of people but our highlights were The Killer at Enigma Escape in London – worked well with only two and soooo immersive and realistic (and enjoyably scary) – and the uniqueness of Curio in Nottingham was really quite special! Will check out your guide to the UK rooms and let you know how we get on! Hang on I’ve just checked your blog about London games – I think we actually did the Killer as two people based on your recommendation just over a year ago! Your site must have come up after a Google search for 2 player escape rooms London, so thanks so much for it, we loved it!